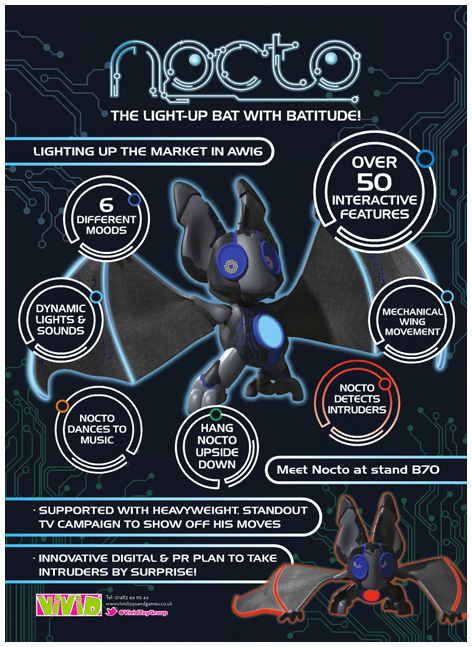 Nocto Bat - The Light-Up Nocto Toy Bat! Even though we're not big fans of bats here at Toy Shop UK HQ, we can't help but fall just a little bit in love with Nocto. He looks a little scary at first, but once you power him up and start using any of the 50+ interactive features we think you're going to warm to him too. Little Nocto is actually a teenager who, like all other bats his age, likes to chill out, listen to music and sleep. Being at the slightly awkward age he is though makes him prone to the odd bout of mood swings and you'll know a mile off when he should perhaps be left alone. Nocto has six built-in moods, each associated with lights, expressions, sounds and movements. He also comes with four in-built games, including his favourite one: Fruit Bat Machine. 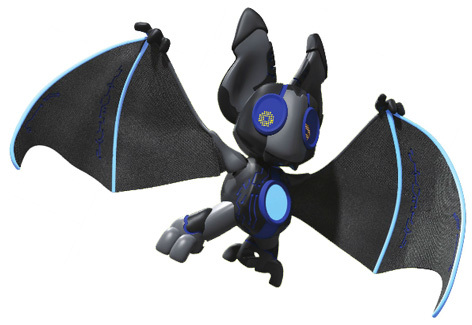 Mechanical wing movements, the ability to hang upside down and his love of dancing to music are just a few of the other features that make Nocto so adorable. Please tell us what you think of Nocto by Vivid.